Visiting Tokyo and looking for a place to swim? Nice choice! Don't forget to tell us how did it go. 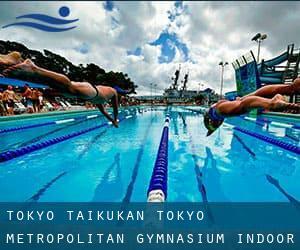 Introducing now Tokyo Taikukan (Tokyo Metropolitan Gymnasium Indoor Pool) swimming pool, a fantastic swimming pool sent by a swimmer like you few days ago. Have you visit this pool? Do you work here? Please, contact us if you have information and facts that you consider is gonna be helpful and keep in mind from now on it is possible to now promote every pool just by sharing this page with your pals or adding comments in the Facebook boxes below. Come on and assist this pool to be the first in Tokyo! Swimmers like you have reported Olympic size x 20 meters, 8 lanes, 1.2 meters - 2.2 meters depth, 1.2 meters - 2.2 meters depth, Indoors. Also, you will find 25 meters x 13 meters, 6 lanes, 1.2 meters - 1.4 meters depth, 1.2 meters - 1.4 meters depth, Indoors. Just in case you wish to contact this Swimming Pool just before dropping by, we only know the phone number. Take the JR Line to the Sendagaya station. The facility is directly across the street; enter under the pyramid; the pool entrance is on the right side, lower level. Or take the Oedo line of the Tokyo Metro to the Kokuritsu-Kyogijo station. Updated on 2019 3-26-46, Haginaka , Ota-ku , Tokyo , JAPAN (Postal Code: 144-0047). This sports center gives 25 meters x 11 meters, Indoors. For this Swimming Pool, only phone number is number here. Updated on 2019 2-10-4 Toranomon , Minato-ku , Tokyo , JAPAN (Postal Code: 105-0001). This sports center offers 20 meters, 6 lanes, 1.1 meters - 1.2 meters depth, 1.1 meters - 1.2 meters depth, Indoors. For this Swimming Pool, only phone number is number here. Updated on 2019 1-1, Uchisaiwai-cho 1-chome, Chiyoda-ku, Tokyo , Chiyoda-ku , Tokyo , JAPAN (Postal Code: 100-8558). This sports center offers 17.5 meters, 2 lanes, Indoors. For this Swimming Pool, only phone number is number here. Updated on 2019 3-29-2, Ootsuka , Bunkyo-ku , Tokyo , JAPAN (Postal Code: 112-0012). Few days ago a normal user of this center told us they offer 25 meters x 13 meters, Indoors. Furthermore, they keep in good conditions 20 meters x 4.5 meters, Indoors. For this Pool, only phone number is number here. Kamata 5 - 47 - 7 , Ota-ku , Tokyo , JAPAN (Postal Code: 144-0052). Among all the activities offered by the center, for anyone who is interested in swimming you are going to take pleasure in 25 meters, 5 lanes, Indoors. Just in case you need to get in touch with this Pool before dropping by, we only know the phone number. Updated on 2019 6-10-3 Roppongi , Minato-ku , Tokyo , JAPAN (Postal Code: 106-0032). Among all the activities supplied by the center, for anyone who is keen on swimming you will enjoy 20 meters x 7 meters, 3 lanes, Indoors. If you should make contact with this Swimming Pool, email address and phone number are both number. 2-20, Hirano 3-chome , Koto-ku , Tokyo , JAPAN (Postal Code: 135-0023). Swimmers like you reported 25 meters, 7 lanes, 1.1 meters - 1.4 meters depth, 1.1 meters - 1.4 meters depth, Indoors. Unfortunately we do not have the email address of this Swimming Pool, but we can provide you with the phone number. Updated on 2019 2-1-8, Uchi-Kanda , Chiyoda-ku , Tokyo , JAPAN (Postal Code: 101-0047). Swimmers like you reported 25 yards, 6-8 lanes, 1.3 meters - 1.6 meters depth, 1.3 meters - 1.6 meters depth, Indoors. Unfortunately we do not have the email address of this Swimming Pool, but we can give you the phone number. 2-8-10, Tatsumi , Koto-ku , Tokyo , JAPAN (Postal Code: 135-0053). Few days ago a common user of this center told us they offer Olympic size x 25 meters, 10 lanes, Indoors. Furthermore, they keep in good conditions Olympic size x 15 meters, 7 lanes, 1.2 meters - 1.4 meters depth, 1.2 meters - 1.4 meters depth, Indoors. Contact information for this Swimming Pool which include phone number and email address are number. Updated on 2019 This sports center gives 25 meters, 6 lanes, Indoors. For this Swimming Pool, only phone number is number here. 4-8-1 Shiba Koen , Minato-ku , Tokyo , JAPAN (Postal Code: 105-8563). Few days ago a standard user of this center told us they offer 25 meters x 5 meters, 2 lanes, 1.4 meters depth, 1.4 meters depth, Indoors. Furthermore, they keep in good conditions 20 meters x 2.5 meters, 1 meters - 1.1 meters depth, 1 meters - 1.1 meters depth, Indoors. For this Pool, only phone number is number here. East Ikebukuro 3 - 1 - 4 , Sunshine City Cultural Centers 5th Floor , Toshima-ku , Tokyo , JAPAN (Postal Code: 170-0013). This sports center offers 25 meters, 5 lanes, Indoors. For this Pool, only phone number is number here. 3-49-1, Hatagaya , Shibuya-ku , Tokyo , JAPAN (Postal Code: 151-0072). Among all of the activities offered by the center, when you are interested in swimming you will take pleasure in 25 meters x 13 meters, Indoors. Just in case you need to make contact with this Pool before dropping by, we only know the phone number. 3-2, Yumenoshima , Koto-ku , Tokyo , JAPAN (Postal Code: 136-0081). Among all of the activities offered by the center, if you are keen on swimming you will take pleasure in 25 meters x 15 meters, 7 lanes, 1.2 meters - 1.4 meters depth, 1.2 meters - 1.4 meters depth, Indoors. Just in case you want to contact this Swimming Pool before dropping by, we only know the phone number.